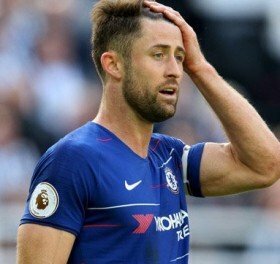 Chelsea captain Gary Cahill has reportedly emerged as a transfer target for Chelsea before the close of the winter transfer window. The 33-year-old has just six months remaining on his existing deal with the Blues and he has recently found himself excluded from matchday squads. Amidst this, Fulham have been touted to secure a deal for the Englishman but The Sun claims that they could face competition from London rivals Palace. It is added that the Eagles would only propose a temporary deal for the veteran and the move may lead to Scott Dann making the loan switch to Fulham. Dann has only recently returned to the Eagles mix after a long-term injury and it is suggested that he could fancy a temporary deal rather than warming the club's bench. The former Eagles captain has made just two starts through the ongoing campaign and both of those have come in the FA Cup against Grimsby Town and Tottenham Hotspur respectively.